CAL is a company limited by guarantee which campaigns to achieve urgently and sustainably full compliance with World Health Organisation (WHO) guidelines for air quality throughout London (and elsewhere). Transport is a major cause of air pollution in London which in turn causes thousands of premature deaths per year, and many thousands more instances of illness, chronic illness and disability. For this reason, transport measures are also measures to deal with air quality. Ambient or outdoor air pollution comprises particles and gases. The particles, which can comprise anything from tiny droplets to diesel soot and tyre and brakewear, are called ‘particulate matter’ and classified by their aerodynamic diameter in microns (one-millionth of a metre (µm) which is about one-hundredth of the thickness of a human hair) e.g. PM2.5 and PM10. The gases, which can coalesce and become particles, are mainly nitrogen dioxide (NO2), ozone (O3) and sulphur dioxide (SO2). The WHO says there is little evidence to suggest a threshold below which no adverse health effects would be anticipated for particulate matter or, put another way, there is no safe level of human exposure to it. An ‘Update of WHO air quality guidelines’ (AQG) published in February 2008 said “The AQG have always addressed exposures and health effects of individual pollutants or indicators (such as PM10 mass, an indicator of a complex pollution mixture with multiple sources). However, as understanding of the complexity of the air pollution mixture has improved, the limitations of controlling air pollution and its risk through guidelines for single pollutants have become increasingly apparent. Nitrogen dioxide (NO2), for example, is a product of combustion processes and is generally found in the atmosphere in close association with other primary pollutants, including ultrafine particles. It is itself toxic and is also a precursor of ozone, with which it coexists along with a number of other photochemically generated oxidants. Concentrations of NO2 are often strongly correlated with those of other toxic pollutants. Its concentration is readily measured but needs interpretation as a potential surrogate for a set of sources and the resulting mixture. Achieving guideline concentrations for individual pollutants, such as NO2, may therefore bring public health benefits that exceed those anticipated on the basis of estimates of a single pollutant’s toxicity”. NO2 is not just a molecule therefore as the Government would have us believe. UK planning law – Limit values are a material consideration in the planning system (Note 1). Developments should not proceed if they are likely to cause or contribute to a breach, or the worsening of a breach, of a limit value unless the impacts are fully mitigated. Limit values are concentrations to be attained and not exceeded once attained. 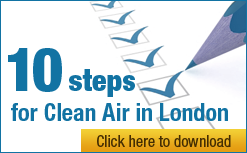 Directive 2008/50/EC is transposed into UK law through the Air Quality Standards Regulations 2010. Directive 2008/50/EC also permits a process of compliance flexibility, whereby Member States can obtain time extensions of up to five years to comply with NO2 limit values subject to strict conditions. For the purposes of air quality assessment each Member State is divided into a number of different zones; to obtain a time extension a Member State must submit a plan for each zone in exceedance that will demonstrate how compliance with the limit values will be achieved as quickly as possible, and in all cases by the latest possible deadline of 1 January 2015. 12 zones were denied time extensions (but may reapply). The UK Government did not apply for time extensions for the remaining 16 zones, as they did not expect them to comply by 2015. These zones include Greater London, where compliance is not expected until 2025. All zones without a time extension may now be the subject of enforcement action by the Commission, as the original 2010 deadline still applies to them. NO2 emissions are produced by both airside operations (aircraft and airport vehicles) and also by road traffic accessing airports. Whilst many major airports contribute towards local exceedances of NO2 limit values, the problems are most acute at Heathrow due to its status as the UK’s largest and busiest airport and the proximity of two major motorways. The 2008 consultation ‘Adding Capacity at Heathrow Airport’ presented the results of air quality modelling that suggested that oxides of nitrogen (NOx) emissions from road vehicles would fall over future years as older vehicles were replaced by newer, cleaner vehicles. As a result ‘headroom’ would be created for the airport to expand whilst meeting NO2 limit values. This assumption was challenged by CAL and others, who suggested that a wider range of NO2 scenarios should be investigated. As a result, following the consultation, the Government announced that the operational use of new capacity (e.g. a new runway) would be restricted until air quality limit values were met, with the Environment Agency given responsibility for ensuring that air quality around Heathrow did not breach these limits. CAL understands that the modelling of aviation’s impact on air quality assumes no impact when aircraft are above 1,000 metres i.e. other than the landing and take-off cycle. Since 2008 the air quality policy landscape has changed significantly. First, as detailed above, the UK has not obtained a time extension until 2015 to comply with NO2 limit values throughout the Greater London zone. This brings the threat of enforcement action, but also means that planning decisions must consider a 2010 deadline for NO2 compliance in the zone rather than the 2015 deadline previously assumed in airport expansion consultations. NO2 has increased as a percentage of NOx emissions from around 5% to nearly 25%. This evidence means that it is unrealistic to assume a downwards trend in NOx emissions and associated NO2 concentrations to provide ‘headroom’ for increased emissions from airport expansion. Even if the forthcoming Euro 6/VI standard successfully addresses the problems of ‘real world’ diesel emissions it will be many years before this has an appreciable impact on emissions from the UK’s vehicle fleet as a whole. The Government blames the European engine emission standards for its failure to comply with NO2 limit values. But: Euro standards never set limits on NO2; and successive Governments have incentivised the purchase of diesel vehicles when they knew doing so would cause more problems than petrol and after they knew the proportion of NO2 as a fraction of NOx emissions was rising. Successive Governments have failed to mitigate or adapt to this public health crisis. The WHO has recently classified diesel exhaust as carcinogenic for humans. CAL is calling for proposals from the Commission that will deliver continuity and the further tightening of health and legal protections during the Commission’s ‘Year of Air’ in 2013. Such proposals are expected in September 2013 or later. In contrast, the Department of Environment Food and Rural Affairs (Defra) has said ‘Working in partnership with other Member States, we will also use the European Commission review of air quality legislation, expected in 2013, to seek Amendments to the Air Quality Directive which reduce the infraction risk faced by most Member States, especially in relation to nitrogen dioxide provisions”. If Defra succeeds, it will reduce by around 50% current health and legal protections near the UK’s busiest roads. CAL is campaigning to protect public health and enforce legal standards for air quality and hopes to achieve other benefits by supporting sustainable development. restricting the availability of new capacity via an environmental regulator (as per the 2008 Heathrow policy) may be one option for controlling air quality impacts. However, in light of points 2 and 3 above it is far more likely that more stringent restrictions on the operational use of new capacity would be needed than previously thought e.g. implementing low emission zones around airports that would restrict or ban the use of diesel vehicles. Limit values are legally binding and must be complied with in full where they apply in order to provide minimum public health protections. Please contact me if you have any questions regarding this response.